Would you like to add another freelance site to your list? Do you enjoy longer projects rather than shorter ones? Are you someone who is comfortable with more challenging, “high-end” types of freelance projects? Well, then Blur Marketing might be the right freelance opportunity for you. What Exactly is Blur Marketing? Blur Marketing is a site where freelancers can write pitches (proposals) and try to land potential projects. The site was founded in 2010 in the UK by Philip Letts, the CEO and founder. Among their clients are eBay, Zurich, PitneyBowes, and CNN to name a few. Blur Marketing offers a platform where creatives can offer their services direct to the people commissioning them. Blur claims to cut out some of the time and money that used to have to be invested in requests for tender from agencies. What Types of Jobs Are Available at Blur Marketing? That really depends upon what type of work that you want to pick up at Blur Marketing. My understanding is that the stronger the pitch (proposal, RTF)–the better chance of landing the project. Blur Marketing clients are used to seeing very well-written pitches, so if you are not adept at writing them, it would be wise to consult the style guide listed on their site. Projects cover areas like design, marketing, creative, art and innovation campaigns. There are several types of jobs in each of the eight categories: Design, Marketing, Content, Art, Innovation, Technology, Legal, and Accounting. 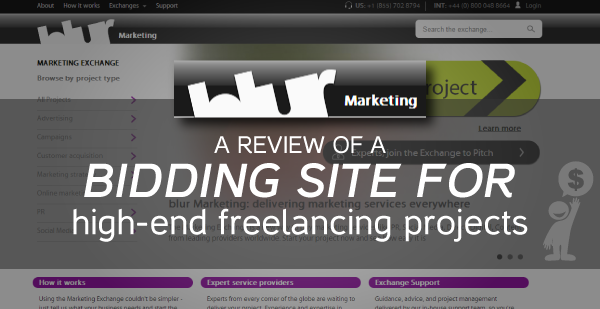 What Makes Blur Marketing Different From Other Freelance Sites? Since being founded in 2010, Blur Marketing strives to have more agency-type jobs (many times, high-end) brought to the freelancer. It has grown to a database of top experts, agencies, and companies in 141 countries. The highest job awarded so far has been $8,083,000. Blur Marketing does not offer tests to be taken like Elance and Odesk. Now, a client may request a test, but most of them depend on the portfolio as well as a well-wri pitch to win the project. How Does Someone Get Started at Blur Marketing? You will need to create an account with a valid email address, password, and username. After your email is verified, you can and should set up a profile. Also, decide if you want to set up a basic account or premium account. The Basic Account is free, but the Premium Account is $50 a month. The Premium Account will allow the service provider to manage multiple projects and clients at the same time as well as create teams to help with the workflow. Can Job Alerts Be Created at Blur Marketing? Yes, job alerts can be created at Blur Marketing so that you are only receiving projects that you are of interest to you. Each alert will come with a brief description and price. Most of the projects are a set price unless the client has a range. However, in your pitch you can always offer to do if for less money to possibly increase your chances of landing the job. The job alerts also have a staff member at blur marketing that you can contact for more information about the project. Are You Considered an Independent Contractor or an Employee at Blur Marketing? As with all freelance sites, you are considered an independent contractor (IC) and responsible for your own taxes. Any calendar year that you make $600 or more you will need to have Blur Marketing send you a 1099 Tax Form. How is Pay Handled at Blur Marketing? Pay is delivered via direct deposit or PayPal. While most of the money is introduced in the form of dollars, get used to seeing the British pound sign, e.p., ?7,500. They will convert it for you, but if you need “to crunch the numbers” ahead of time then you can use Xe.com or any online currency converter. Pay is delivered in increments of every two weeks. What is My Overall Impression of blur marketing? I was impressed with it, and even though I have been receiving inquiries for some time and have not taken advantage of them–doesn’t mean I won’t. They approached me via email in 2010, and I just haven’t had the time to pitch YET. In the beginning, there also weren’t many writing jobs, but I do see more opening. The few reviews that I did find were from satisfied clients, which is a good thing. How Can an Interested Applicant Apply to Blur Marketing? Visit the blur Group site and get started. The rest of the information is listed above. Good luck to all who sign up.